What is Timber Buyers and Specifiers Forum? WE ARE CURRENTLY RECRUITING BUYERS FOR 2015! 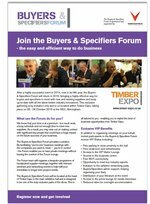 The Timber Buyers and Specifiers Forum offers a structured, highly effective way for buyers to meet with new and existing vendors/suppliers from within the timber industry. This Forum will be hosted at Timber Expo - NEC, Birmingham on the 06-08 October 2015. Our team will organise a bespoke programme of hand-picked supplier meetings, seminars and networking events to help fulfil your immediate to longer term project needs.